In a blog post at the end of last year and in my column in this month's edition of Worcester Park Life magazine, I recounted the devstating events of 16th June 1944 when a V1 Doodlebug fell on Caldebeck Avenue, Worcester Park. "My brother and I were born shortly after the war and as we were growing up we noticed a black and white photo on top of our very old upright piano. The photo was of three young children - two boys and a girl. When we were old enough our mum told us they were our brothers and sister who were killed on that fateful June day in 1944. The story as my Mum told it was that she had just bathed the children - the bathroom in those houses was outside the back door! The children were dressed after their bath and my Mum was cleaning the bath when the Doodlebug hit. The house was demolished and the children killed but Mum survived because the empty bath turned up over her whilst the rest of the house fell on top of it - thank goodness for those old-fashioned baths which withstood the weight of the debris. Needless to say our parents were devestated at their loss - my father was a fireman during the war and people who knew our brothers and sister told the story of the three little white coffins being born along the main road to their final resting place. My Mother passed away in 1996, but this year would have been my her 100 birthday - what a brave woman she was - I am so very proud of her and my Dad." "I was surfing the internet last week, whilst doing some family history research and came across your blog. I was extremely interested in the story of the bombing on the 16th of June 1944. The reason for my interest being that my Mother (along with her sister and a visiting friend) were survivors of that tragic happening. Sadly her Mother (my Grandmother) was not. At the time, my Mother was 13 years old and her sister was 9. They lived at the bottom end of Caldbeck Avenue. She tells me that on the evening of the 16th June, they were looking out of the front window of their house, when they saw what they thought were fireworks exploding in the sky. They then realised that they were mistaken and what they were actually seeing were ack ack explosions. They then heard the sound of a V1 rocket or Doodlebug. (It was not a V2 as was mentioned in the blog, as they did not become operational until 8th September of that year). She says that she didn't hear the engine cut out, but heard the noise that they make as they are coming down. Her mother told them all to get under the table as fast as they could. The Doodlebug then struck and she says that the funny thing was that she remembers there being no sound. After the dust had settled she realised that she was buried underneath the rubble of the home. She then heard her Mother calling her and asking if she was alright. As she was confused she did not answer her. That was the last time that she was to hear her Mother's voice. After what seemed like an eternity she heard the sounds of people digging in the rubble. 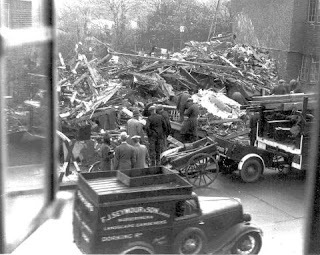 At the time the rescuers didn't know where she was, so as they were moving the bricks and piling them on top of her, the rubble above her was getting heavier and heavier. She then called out and eventually was dug free. Her sister and friend were also rescued. But sadly her Mother was dead. When my Mother and her sister were discharged from hospital they were evacuated to Wiltshire where they remained for the rest of the war. When the houses were rebuilt, my grandfather moved back and lived there until he died in 2001."